Congregation B'nai Jeshurun (Sons of Righteousness) was founded in 1825 by a coalition of young members of Congregation Shearith Israel and immigrants and the descendants of immigrants from the German and Polish lands. B'nai Jeshurun was the second synagogue founded in New York and is the third oldest Ashkenazi synagoguein the United States. It was the stated intention to follow the "German and Polish minhag (rite)." The order of prayers followed that of the Ashkenazi Great Synagogue of London and sought the guidance of the British chief Rabbi Solomon Hirschell on matters of ritual. In 1827, the congregation dedicated its first building on Elm Street, the former First Colored Presbyterian Church. In 1828, at a time of rapid growth in the New York Jewish community, a group left B'nai Jeshurun to found Ansche Chesed. The first rabbi, Samuel Isaacs, was appointed in 1839. By 1850, the congregation had outgrown its building and in 1851 erected a new Gothic-style synagogue, designed by Field & Correja, on Greene Street. In 1865, the congregation moved farther uptown, leasing a plot of land on 34th Street, between Broadway and Seventh Avenue. Field & Correja were again hired to design the new synagogue, this time employing a vaguely Romanesque style with Spanish and Moorish influences. The 75-by-98 foot building provided seating for 650 persons. When the 20-year lease expired in May 1884, the congregation acquired property on the southwest corner of Madison Avenue and 65th Street for a new synagogue. The old building on 34th Street was taken down and the stone and brick used to build the new synagogue. As designed by Rafael Guastavino, working with Schwarzmann & Buchman, the synagogue was modeled after the first synagogue erected in Europe, at Toledo, Spain, and was in the Spanish Renaissance style. The Madison Avenue façade, built of Philadelphia brick and stone, was Byzantine with a Moorish portico at the main entrance. Above the entrance was a tower and cupola that rose to a height of 104 feet. The completed synagogue had a seating capacity of 1000 and was dedicated on March 25, 1885. The present synagogue, located on West 88th Street between Broadway and West End Avenue, was dedicated on May 12, 1918. It was designed by Henry B. Herts, a congregant and celebrated theater architect, with Walter S. Schneider. In addition to its place on the National Register of Historic Places, the synagogue was included in the New York City Riverside Drive–West End Historic District created in 1990. The muqarna-studded ceiling was redesigned following its collapse during renovations in the early 1990s and was replaced with a future-invoking space frame back-lit to simulate a nighttime sky. B'nai Jeshurun took a leading role in founding the Board of Directors of American Israelites in 1859 and the Jewish Theological Seminary of America in 1886. When the Board of Delegates merged with the (Reform) Union of American Hebrew Congregations in 1878, the congregation went along, but in 1884 it left the Reform Movement to join the United Synagogue of America, now the United Synagogue of Conservative Judaism. In 1889, the congregation published its own edition of the prayer book. In the 1990s the congregation left the Conservative movement and is now independent. Specifications of this organ have not yet been located. The status of this organ is unknown. 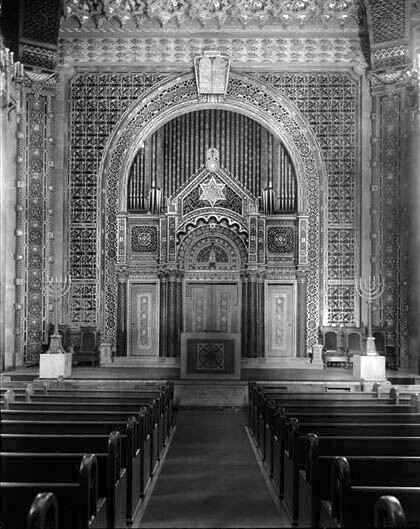 In 1925, the Austin Organ Company of Hartford, Conn., installed a three-manual organ in the Sanctuary of the synagogue. The pipes and mechanism of the organ were located behind an elaborately stenciled pipe façade in the musicians' gallery above the Bima. On the left side of the chamber were the Great and Choir divisions, and on the right was the Swell division; the lone Pedal rank lined the north wall of the chamber. The Echo organ was located in the southwest corner of the rear gallery. Over the years the organ was damaged and pipes were stolen, rendering it unusable. At some point an electronic instrument was installed. The first organ in the present Sanctuary was the 1884 three-manual George Jardine & Son pipe organ that was moved by an unknown builder from the previous building on Madison Avenue. It seems likely that the organ was electrified at this time. Specifications of this organ have not yet been located. The Jardine was replaced by Austin in 1925 when the interior was polychromed. 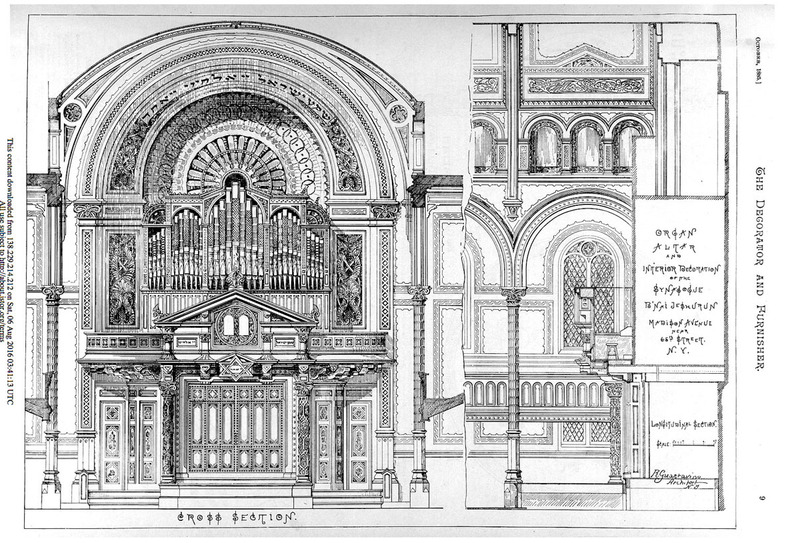 THE MUSICAL COURIER, Vol IX, no 3 July 16, 1884: "Jardine & Son have received the order for a large organ for the Cathedral of Queretaro, Mexico; also a large three-manual organ for the new Jewish temple in Madison Avenue." This organ was originally built by J.H. & C.S. Odell in 1868 for the synagogue located at West 34th Street and Sixth Avenue. Specifications of this organ have not yet been located. "Building a New Synagogue," The New York Times (Mar. 21, 1884). "Dedicating a Synagogue," The New York Times (Mar. 26, 1885). Glück, Sebastian. Stoplist of Austin Organ Co. organ, Op. 1244 (1925). "Many Jewish Dedications," The New York Times (May 13, 1918). Musical Courier (July 16, 1884). Item about George Jardine & Son organ. Courtesy Larry Trupiano. Cosler Theatre Design website: www.cosler.com. Interior of present Sanctuary (1996). The Decorator and Furnisher (Oct. 1885). Longitudinal section of organ and altar. Courtesy Jim Lewis. Glück, Sebastian. 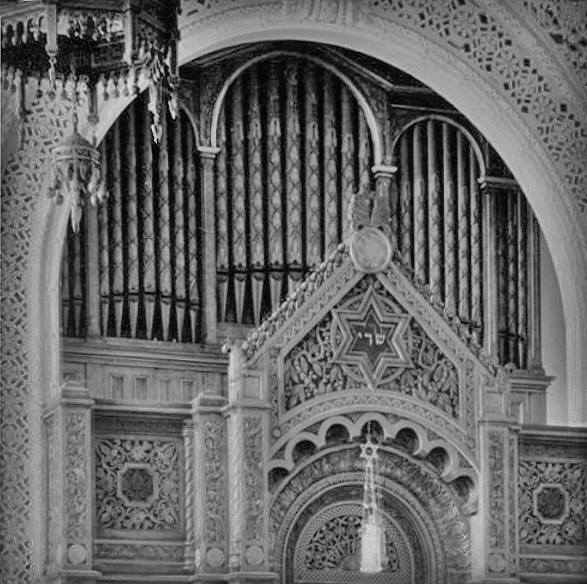 Photo of Organ façade and Bima in 1918. Museum of the City of New York Collection. Dome (1918), Sanctuary Interior (1918). New-York Historical Society Collection. Undated exterior of Madison Avenue Synagogue. Wikipedia.com. Exterior of present Synagogue. Wurts Bros. (New York, N.Y.). Bima and Organ (1926).